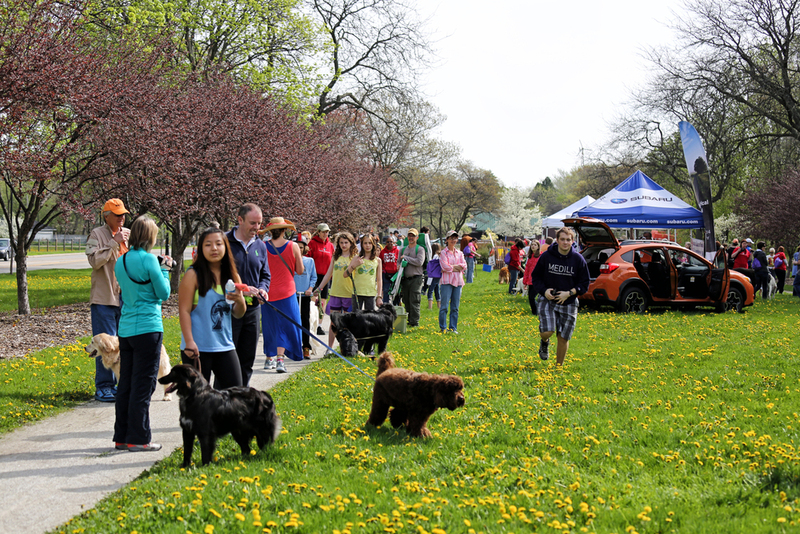 On Saturday, May 11, dogs and their guardians will make their way to Evanston Subaru in Skokie for the Community Animal Rescue Effort’s annual Strut for Strays. 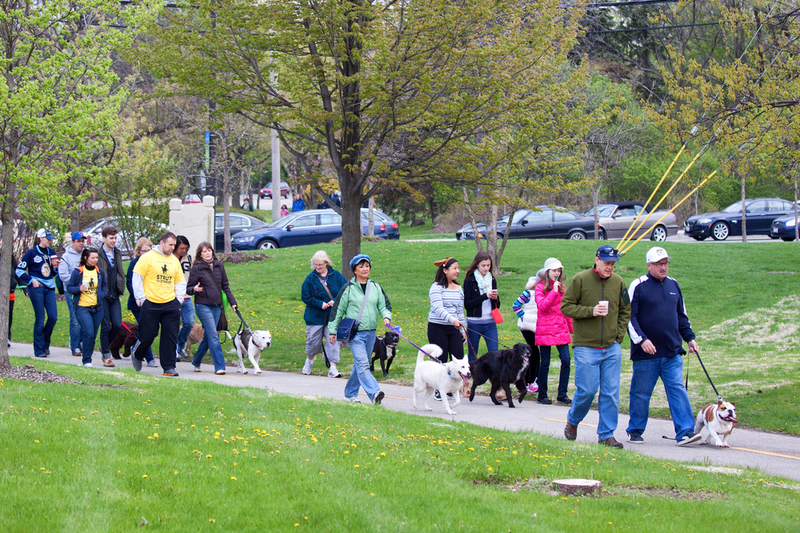 Hundreds of paws and feet will hit the ground walking (or running) for the 2.5-mile event. 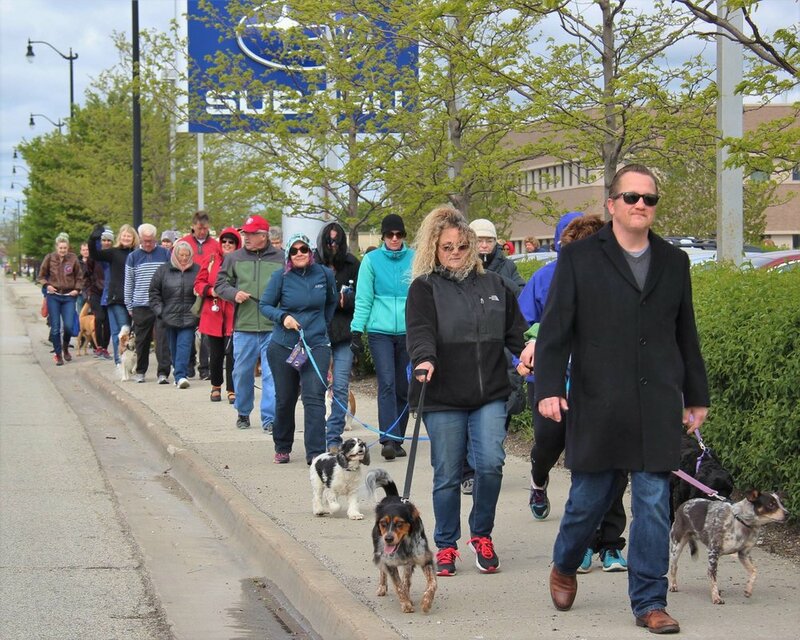 The walking route starts at Evanston Subaru in Skokie and heads East across McCormick (crossing guard present) and up the Skokie Northshore Sculpture Park to Dempster Street. 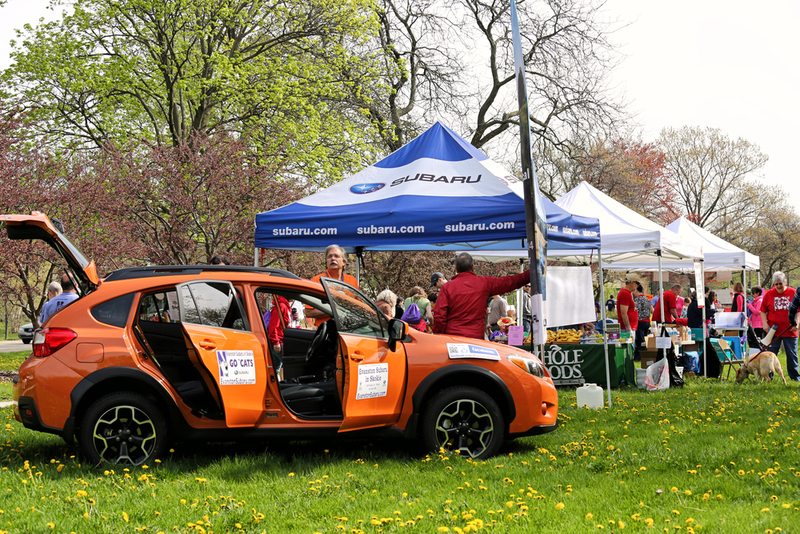 TURN AROUND at Dempster and head South in the Sculpture Park back to Oakton, then West to Subaru. 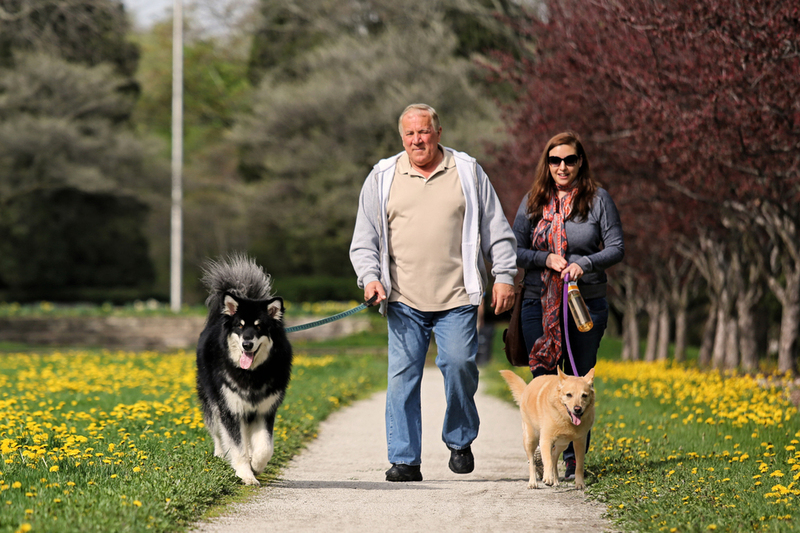 If you're dog is tired or your feet are barkin', you can turn around at any point and head back to Subaru. 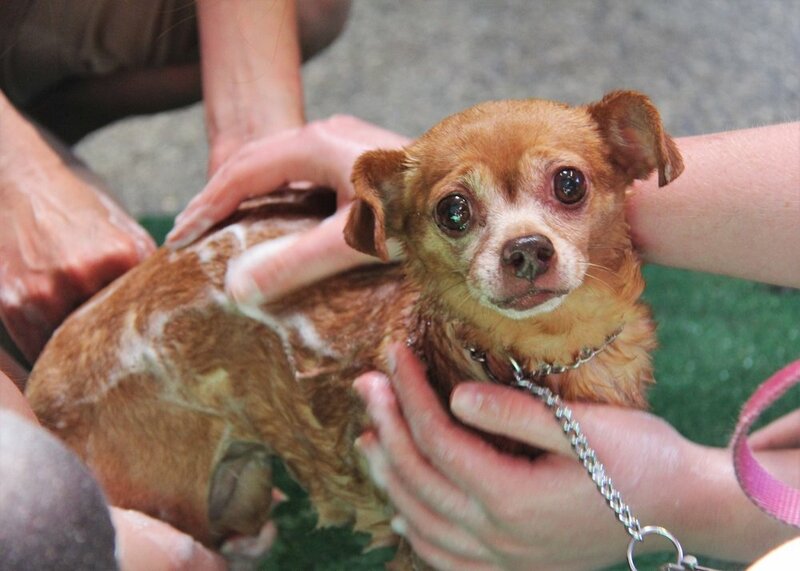 DOES YOUR DOG NEED A BATH? DON'T WANT TO DO IT YOURSELF? 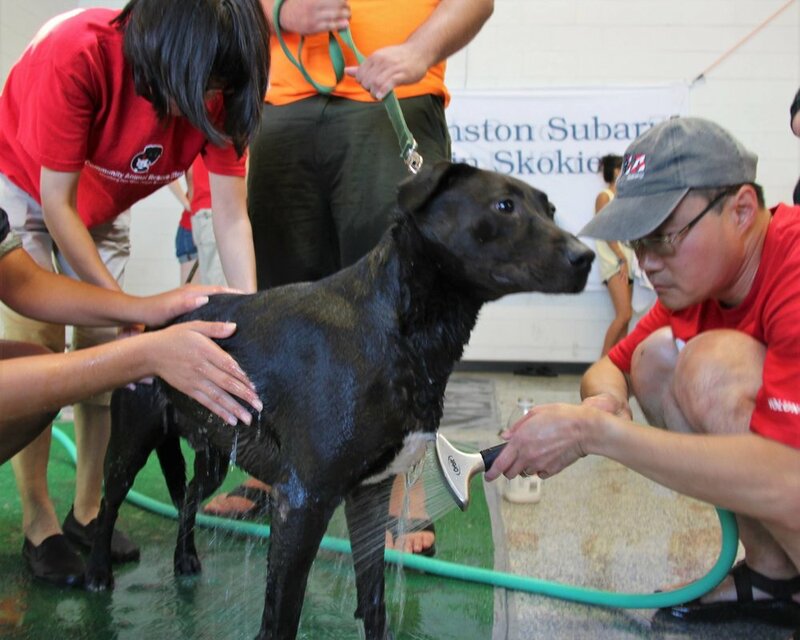 We'll be at Evanston Subaru in Skokie, ready to wash your dog for FREE! 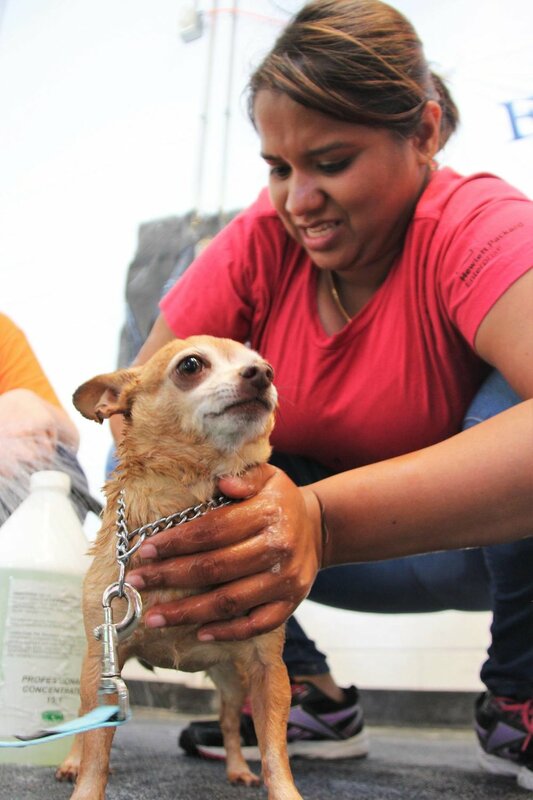 For every dog washed by C.A.R.E. 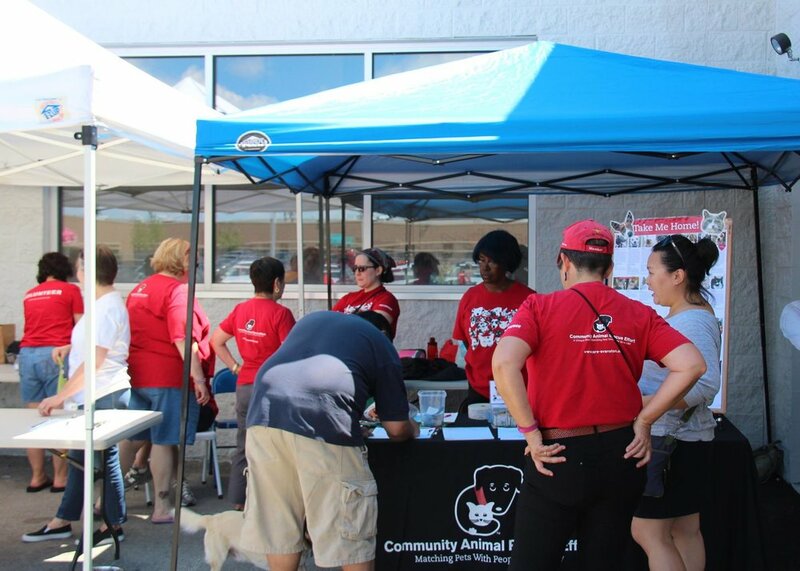 volunteers, Evanston Subaru in Skokie will donate $10 to Community Animal Rescue Effort! Save room for lunch! Evanston Subaru is also hosting a BBQ for the Troops – burgers, brats and hot dogs with all proceeds to benefit the USO of Illinois. 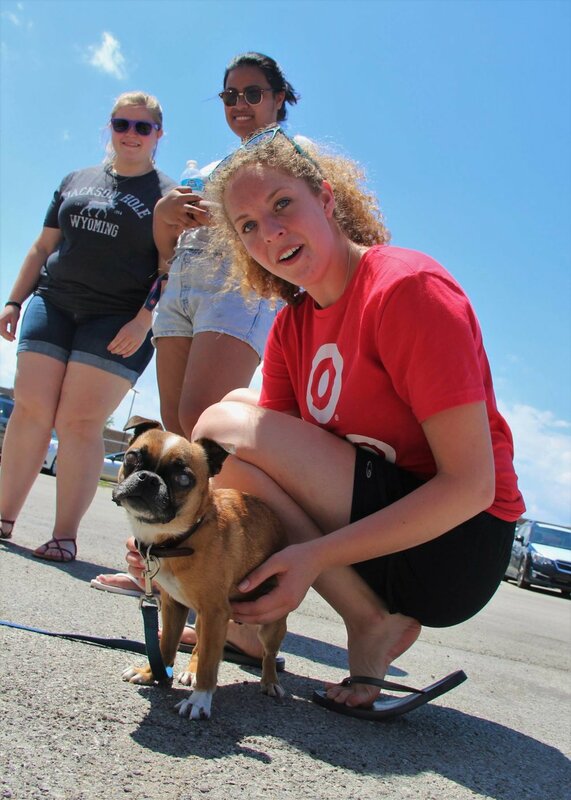 Join us on Saturday, December 7 for a Share the Love adoption event at Evanston Subaru in Skokie. The fun happens from 11 am to 2 pm. 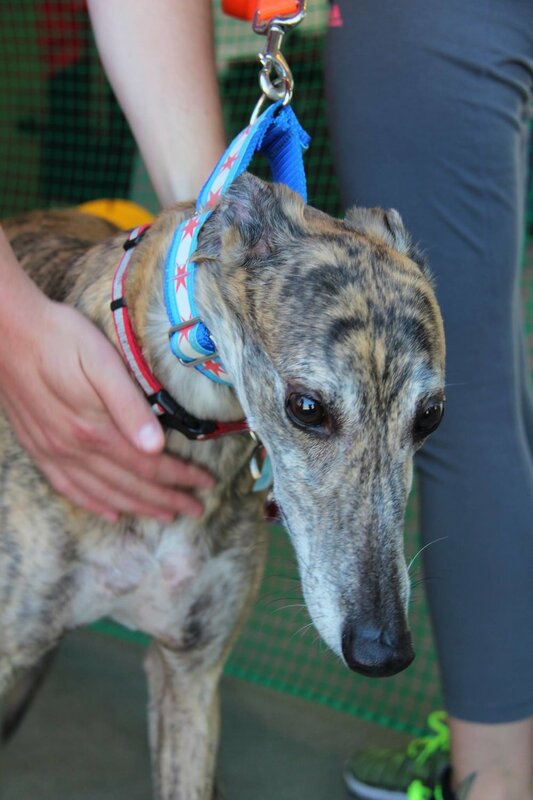 Meet adoptable pets, speak to C.A.R.E. 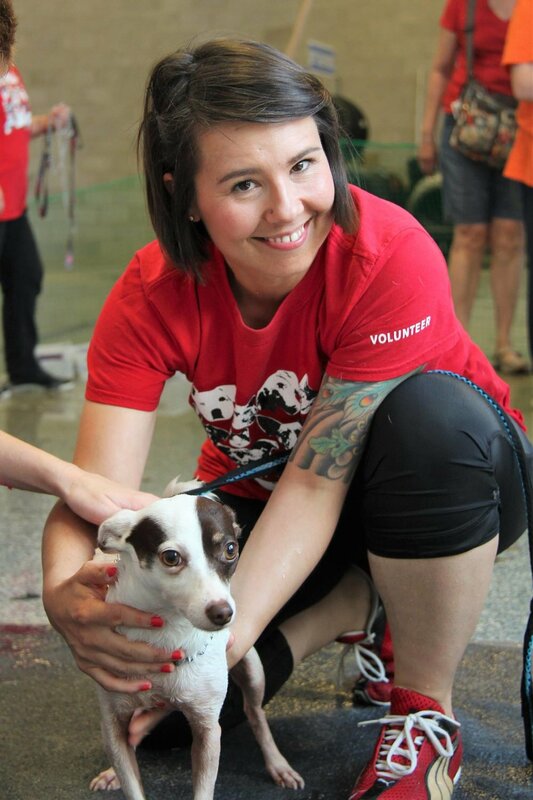 volunteers about becoming an adopter, volunteer or foster home. New square dancers and Club 50-level square dancers will delight in this special Benefit Square Dance for C.A.R.E. , featuring nationally known caller TOM MILLER. 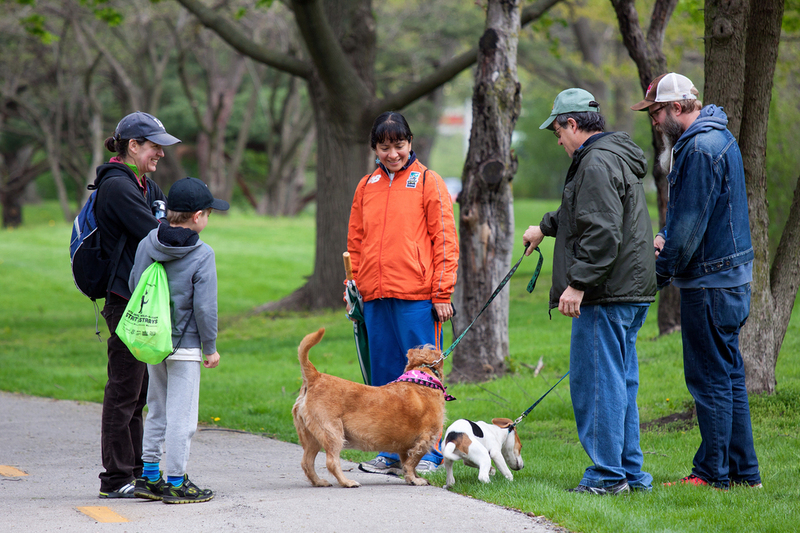 All proceeds from the dance will go toward caring for the cats and dogs of Community Animal Rescue Effort, an all-volunteer animal rescue organization based in Skokie, IL. The first hour of the dance will be at the Basic level (for dancers who started lessons in January 2019); the second hour will be at the Club 50 level. We will include a Plus 'star' tip near the end. 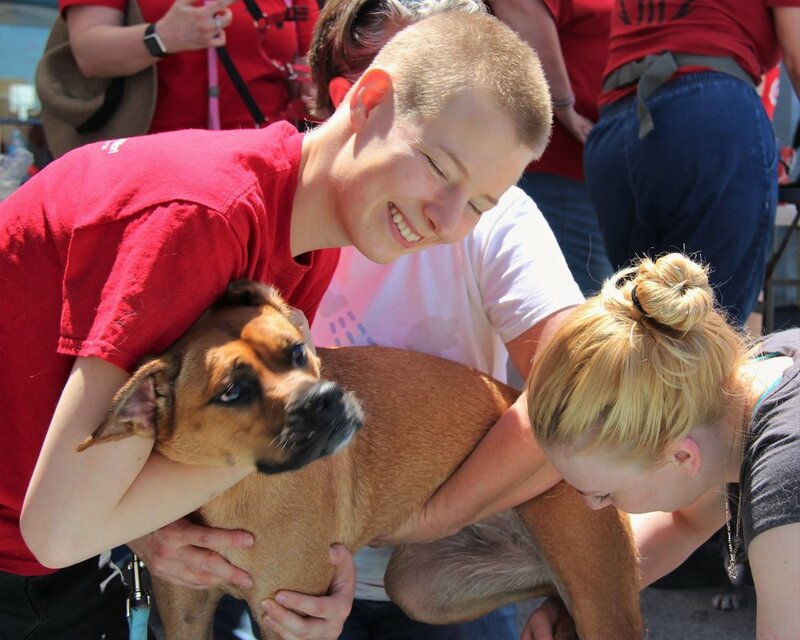 And best of all, dancers will be able to meet some "adorable adoptable" CARE dogs. Enjoy Ten Ninety Brews, Great Food, Trivia & Prizes! 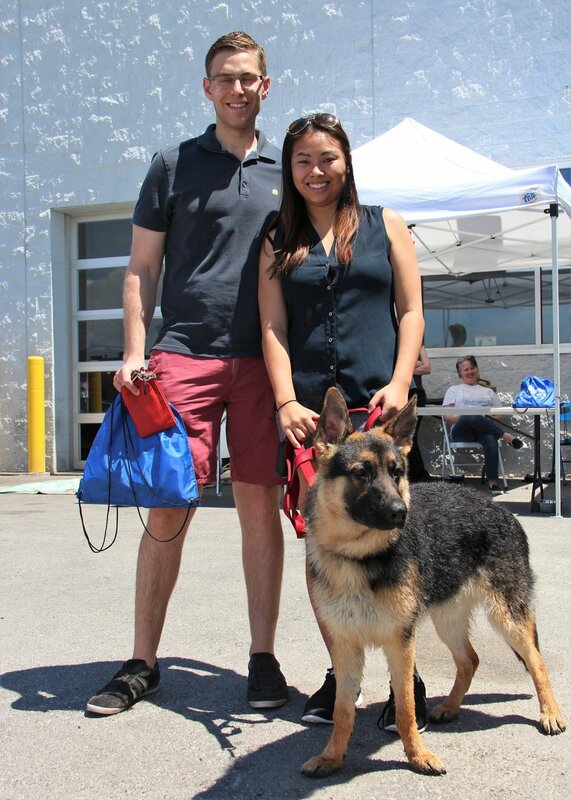 Community Animal Rescue Effort will host the second annual Beer Tasting & Trivia Fundraiser on Sunday, March 3, 2019, at Ten Ninety Brewery in Glenview. This event features great foods, all-you-can-taste Ten Ninety beers, 2 hours of trivia from Pub Trivia USA, Silent Auction and a 50/50 Raffle. Last year, this event sold out weeks in advance, so buy your tickets today! Tickets must be purchased prior to the event. There will be no tickets sold at the door. Trivia Teams consist of no more than 6 players. All attendees must be 21 or older on 3/3/19. To be seated with other players, please include your Team Name and/or Team Captain's name when prompted. If left blank, you will be seated with fellow animal-loving trivia players. Register a Team of 6 buy purchasing a Table Ticket. Table tickets are discounted and allows you to form your own team with 5 other players. 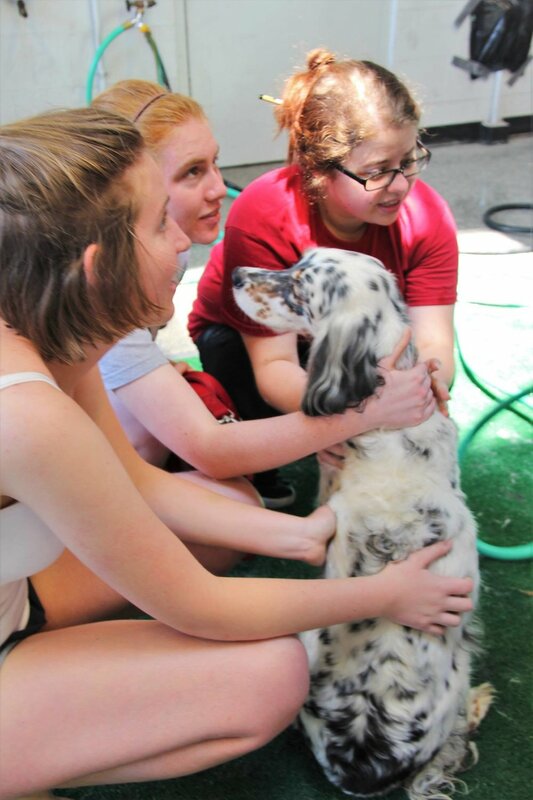 Be it rain or snow (or blue skies), Community Animal Rescue Effort will host its first Indoor Yard Sale & Open House on Saturday, Feb. 16, from 11 am to 3 pm at the Adoption Center, 4927 Main Street, Skokie, Ill. 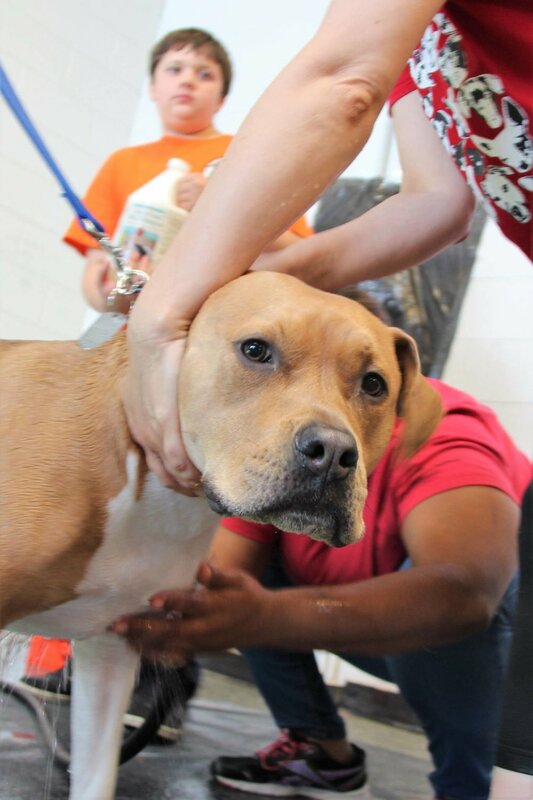 The Indoor Yard Sale will feature some amazing finds, including pet-related items such as dog beds, crates, carriers, heated beds for pets, cat accessories, designer bowls, and also household goods. The collection will include both new and gently used items. 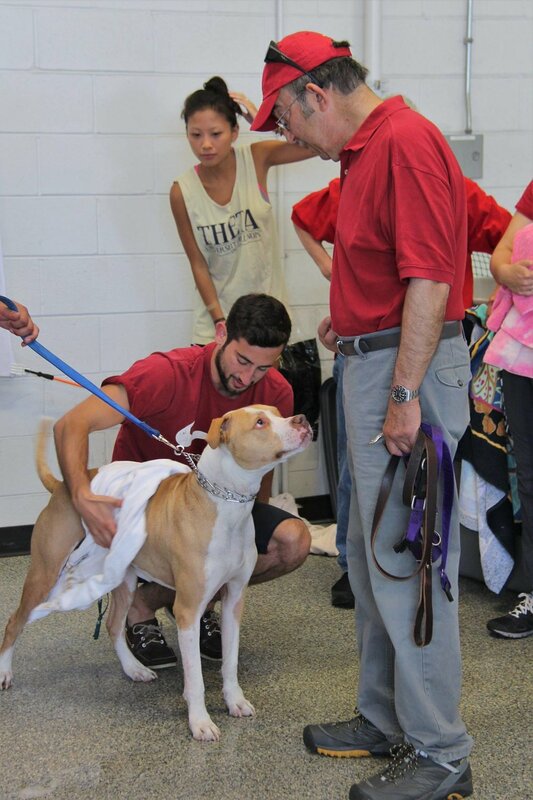 During the Open House, visitors can tour C.A.R.E. Adoption Center (opened last August),and take selfies in front of the fabulous 55-foot mural hand-painted by The Bird Machine artist Jay Ryan in our Community Room. 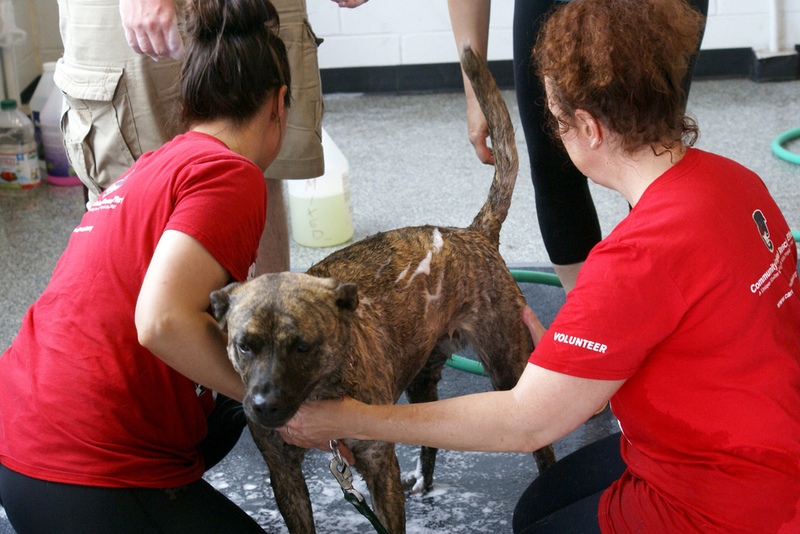 Best of all, adoptable cats and dogs will be ready to step up as your new Valentine. 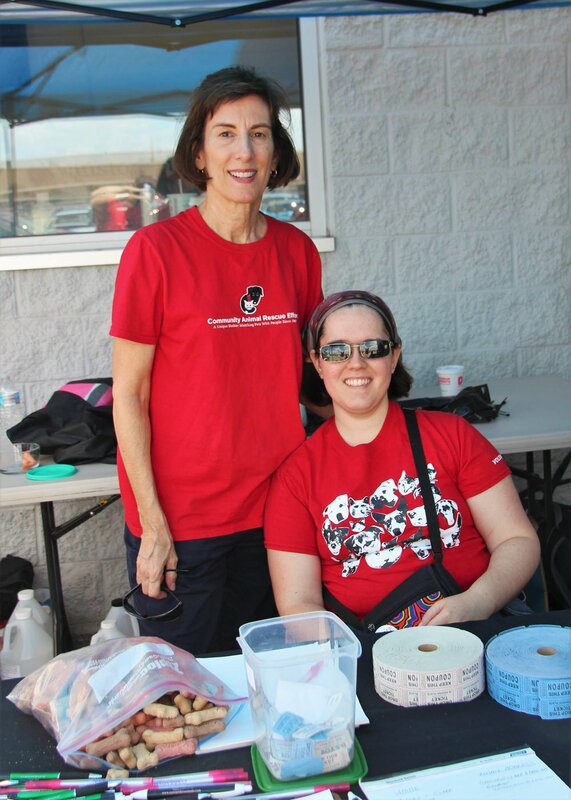 All money raised at the Indoor Yard Sale goes toward caring for and re-homing C.A.R.E. dogs and cats. 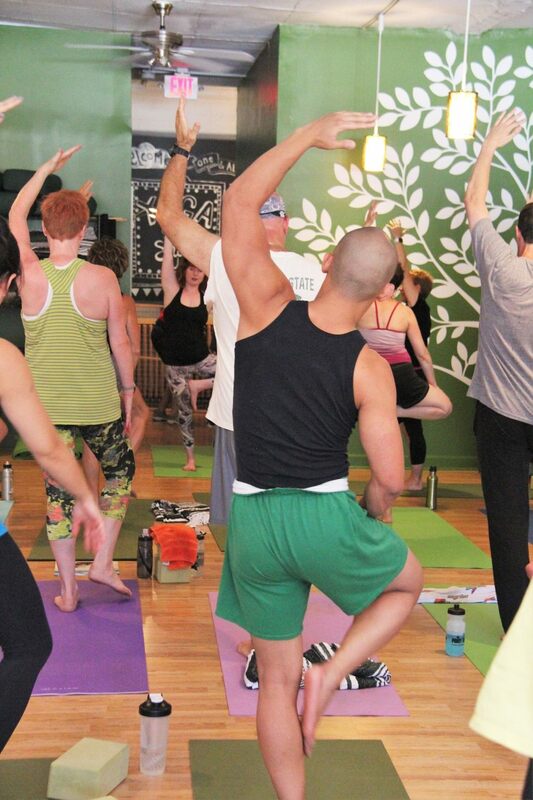 Yoga with Cats for C.A.R.E. Cool C.A.R.E. 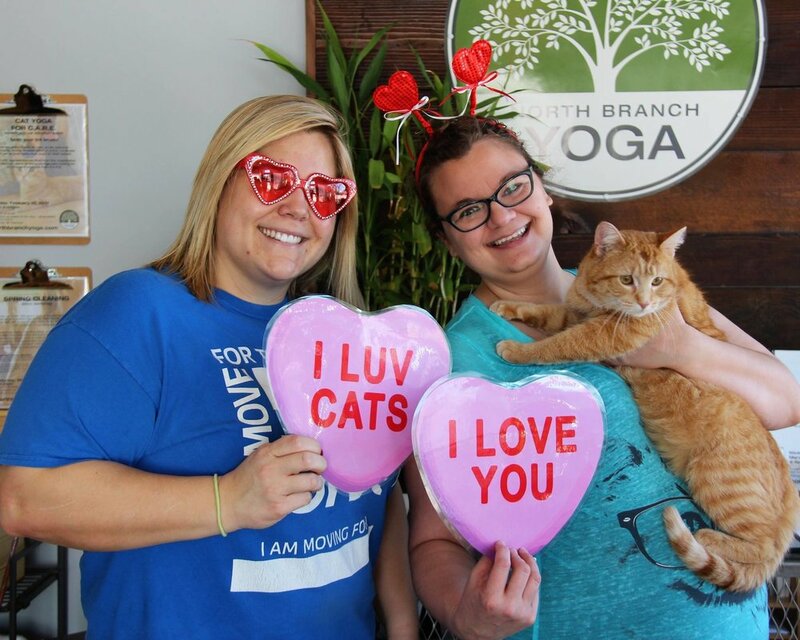 cats return to North Branch Yoga for yoga class! Cats and kittens will have the run of the room while humans hold their poses. Downward cat, anyone? 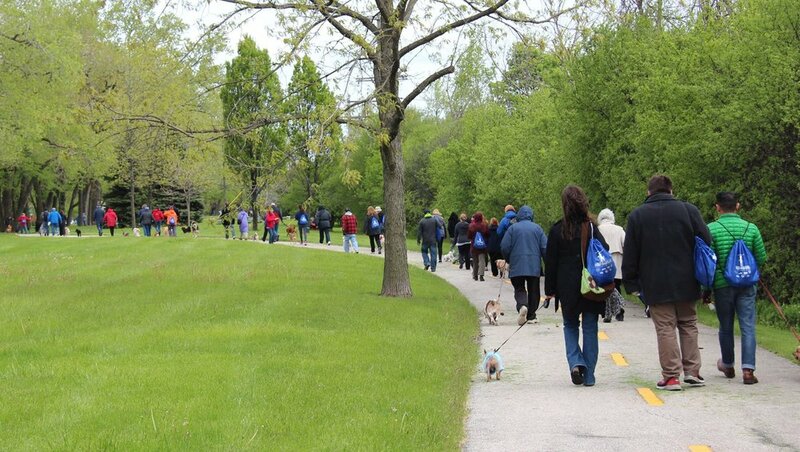 This class will benefit C.A.R.E., now based in Skokie. Recommended donation for the class is $15-$18 based on normal class fees. Come early to visit the cats - class size is limited. Namaste! 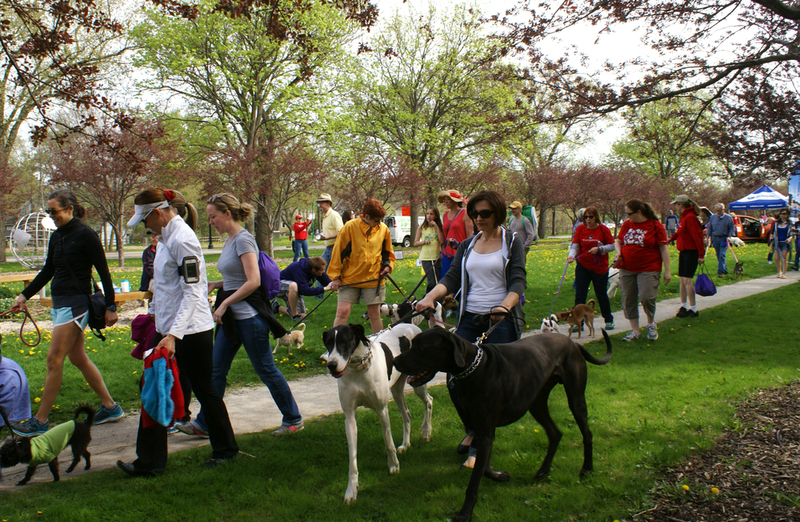 With the support of a grant from ASPCA and Subaru USA, C.A.R.E. has set a goal of finding homes for 16 C.A.R.E. 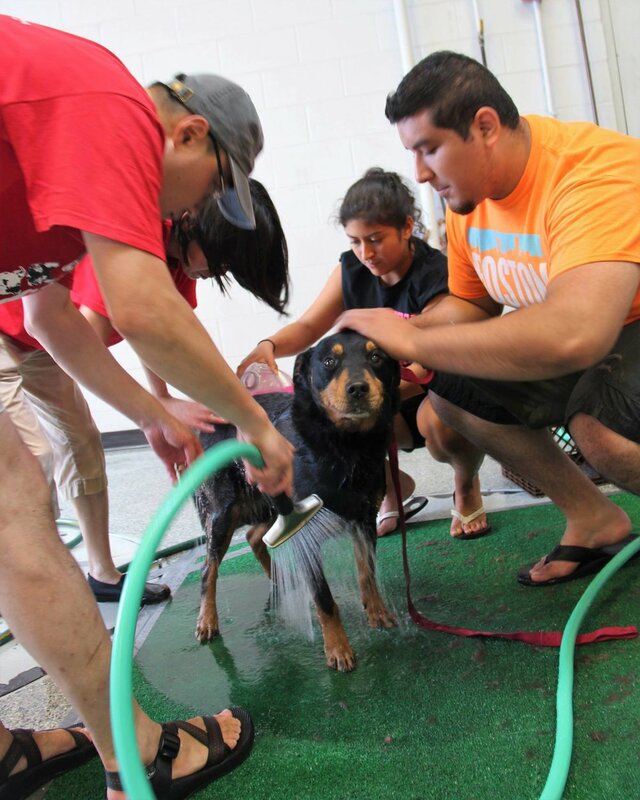 cats and dogs with a variety of activities and events during the week of Dec. 8 – 15, 2018. 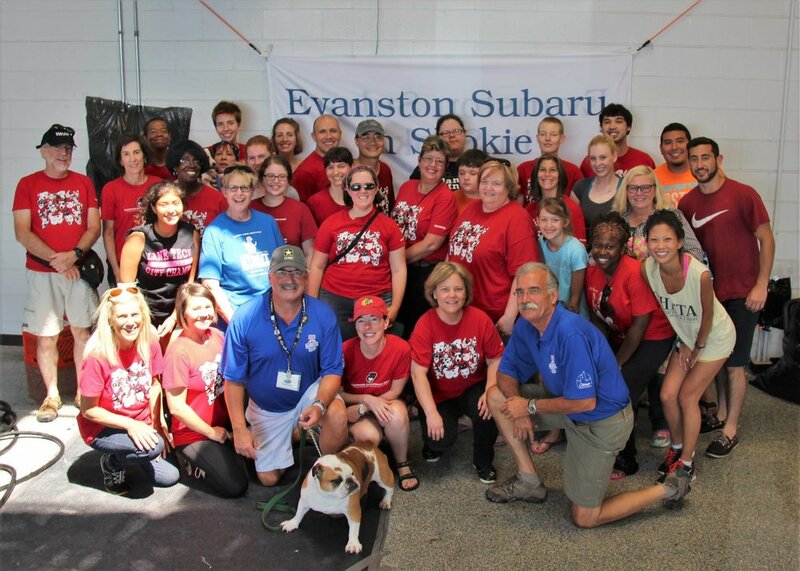 Community Animal Rescue Effort will partner with Evanston Subaru in Skokie to host an eight-day adoption event called ‘Share the Love / Bring Love Home.’ The goal for Share the Love / Bring Love Home week, which runs from Saturday, Dec. 8 through Saturday, Dec. 15, is to find homes for at least 10 C.A.R.E. cats and six C.A.R.E. dogs. 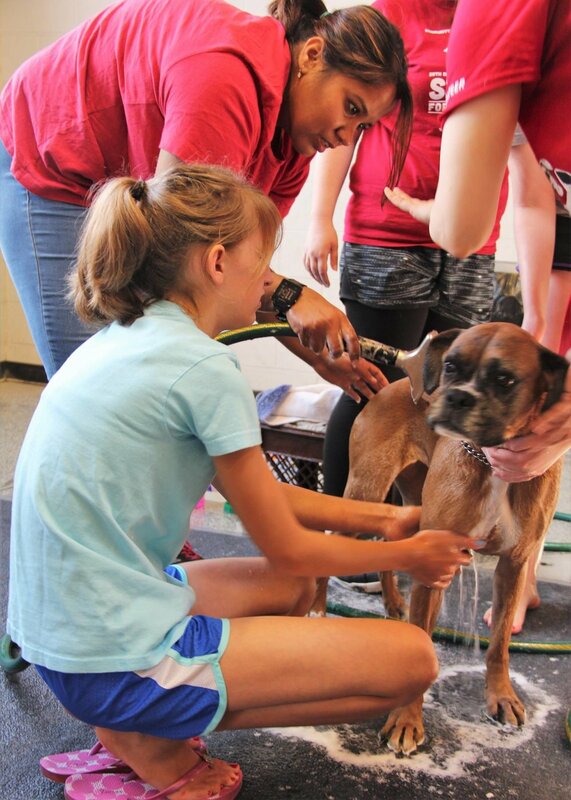 Thanks to support of the grant, C.A.R.E. 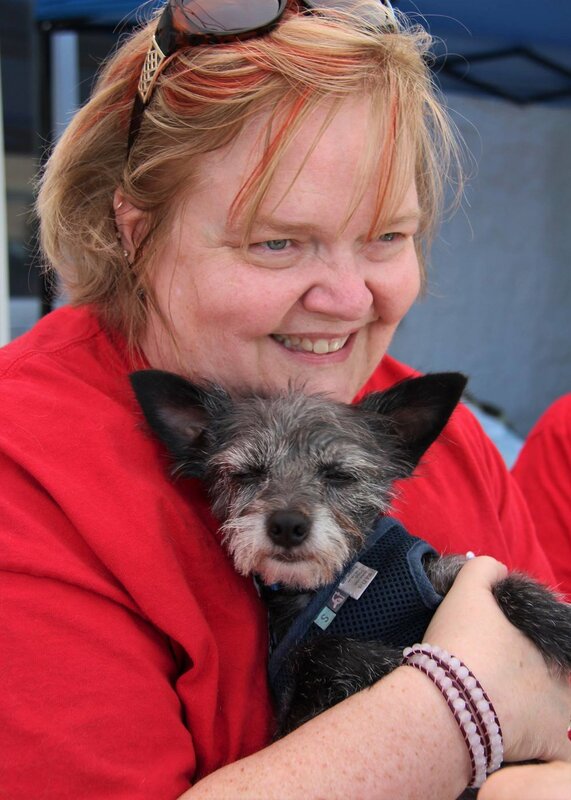 will be able to offer animals at a 50% reduced adoption fee during Share the Love/Bring Love Home week. 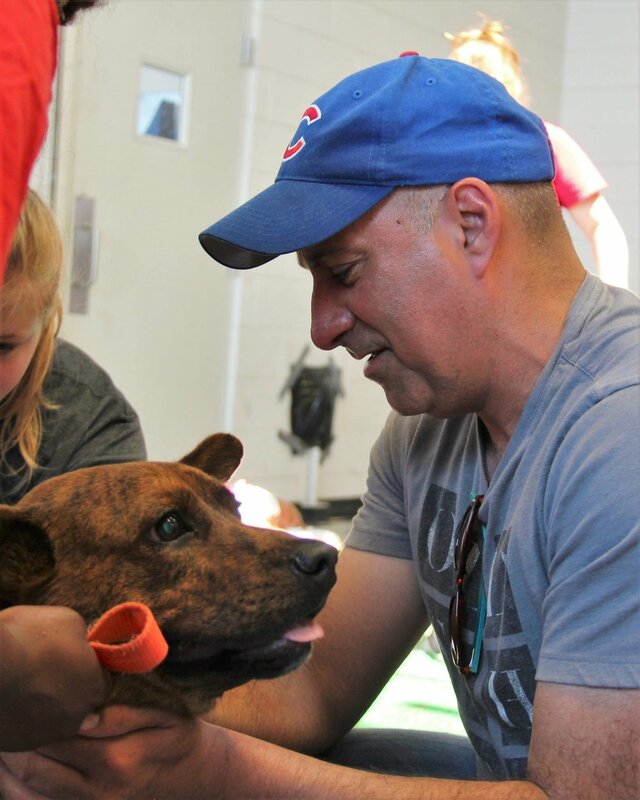 The Share the Love/Bring Love Home program launches on Saturday, Dec. 8, with a ‘Share the Love’ Adoption Event at Evanston Subaru in Skokie. 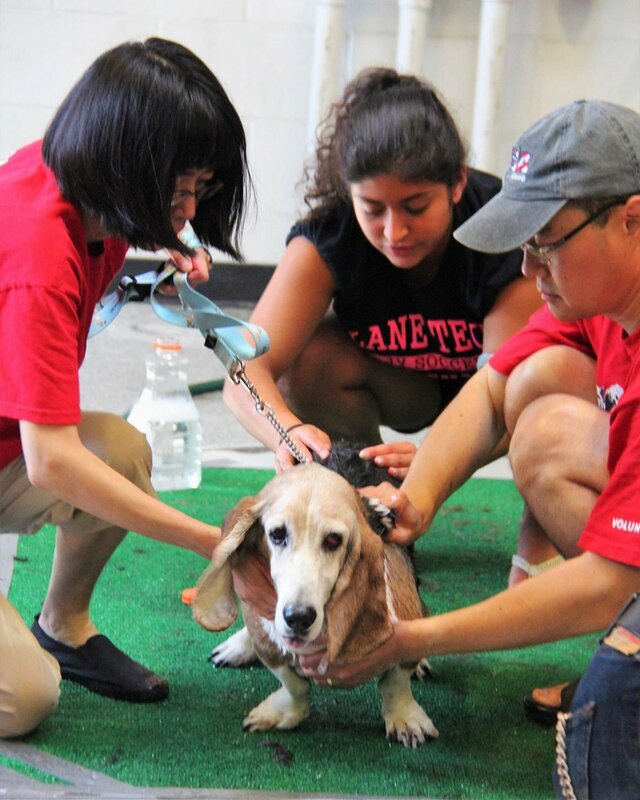 The next seven days take place at C.A.R.E.’s Adoption Center, 4927 Main St., Skokie. 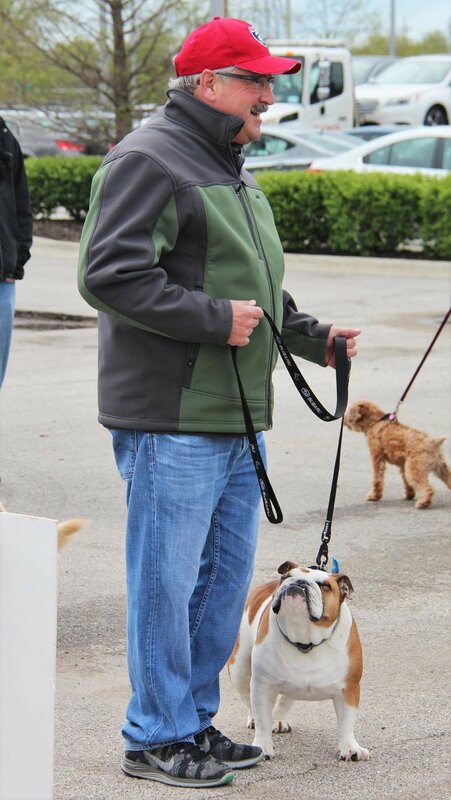 Highlights of each day include Adoption Hours, hot beverages and snacks, games, and chances to meet C.A.R.E. animals. 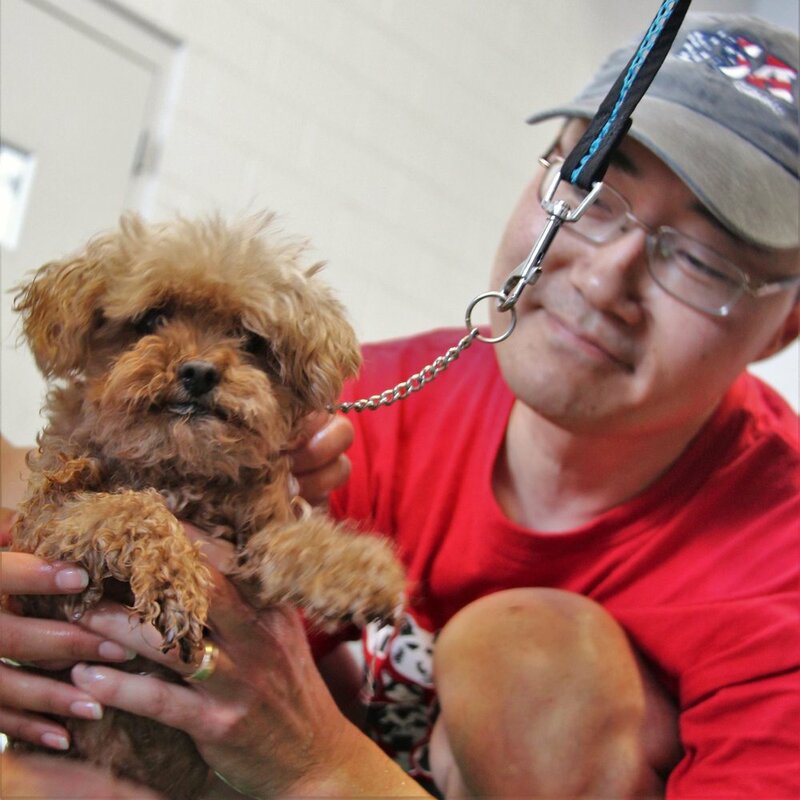 Join us on Saturday, December 8 for a Share the Love adoption event at Evanston Subaru in Skokie. We will also be accepting unopened pet food and supplies to support our adoption program and C.A.R.E. 's Pet Food Corner at Irving Park Community Food Pantry. Join us for a very special shopping event at Ten Thousand Villages in Evanston on Wednesday, December 5, from 6 pm to 9 pm. Shop, enjoy free refreshments and meet C.A.R.E. 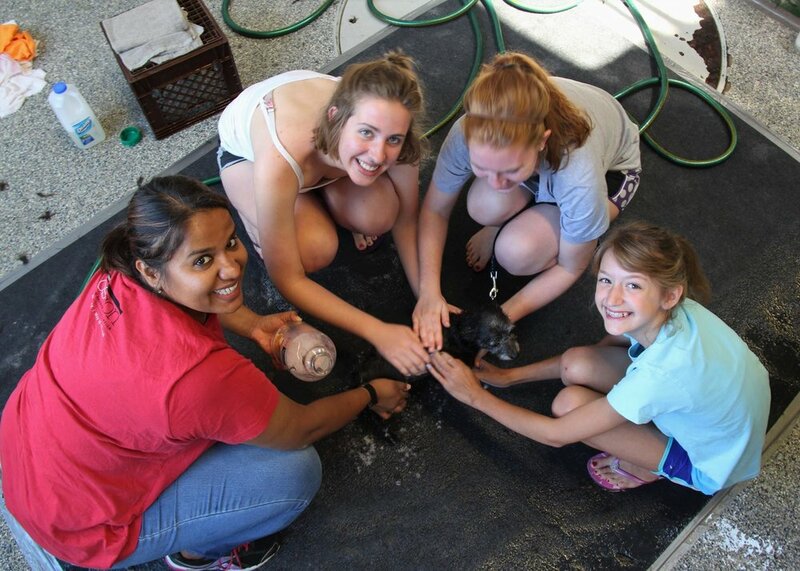 volunteers to find out about some of our pets for adoptions (our adoptables will not be present). C.A.R.E. VOLUNTEERS WILL GIFT WRAP YOUR PURCHASES. Your purchase of fairly traded goods at Ten Thousand Villages always benefits artisans in developing countries, but during this event a percentage of sales will be donated to C.A.R.E. Choose from beautiful home decor and artwork, jewelry, scarves, children's items, fair trade coffee, tea, chocolate and so much more! Invite your family, friends and neighbors to enjoy! 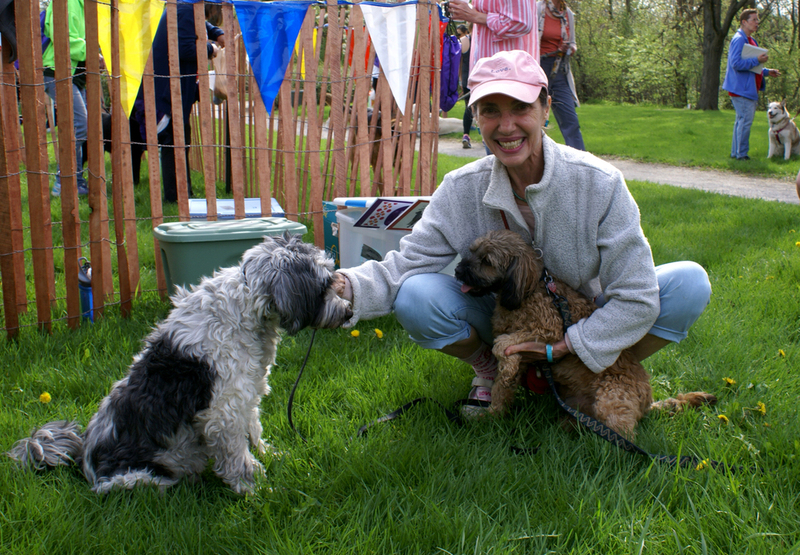 At Community Animal Rescue Effort (C.A.R.E. 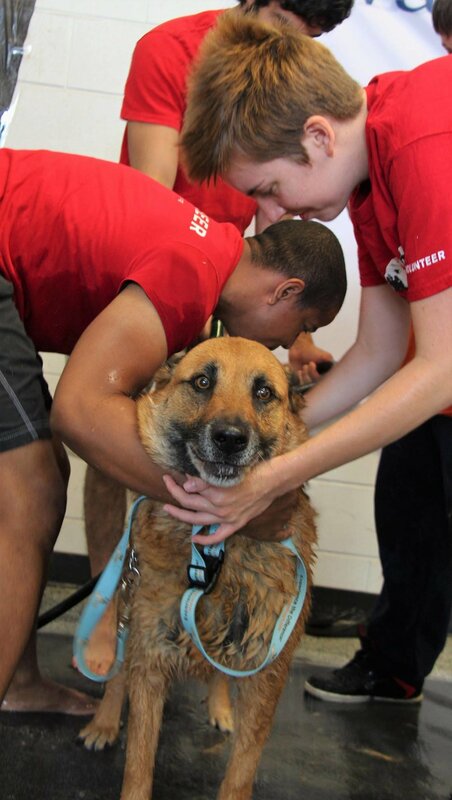 ), our “bosses” are the dogs and cats whose lives we are devoted to saving. 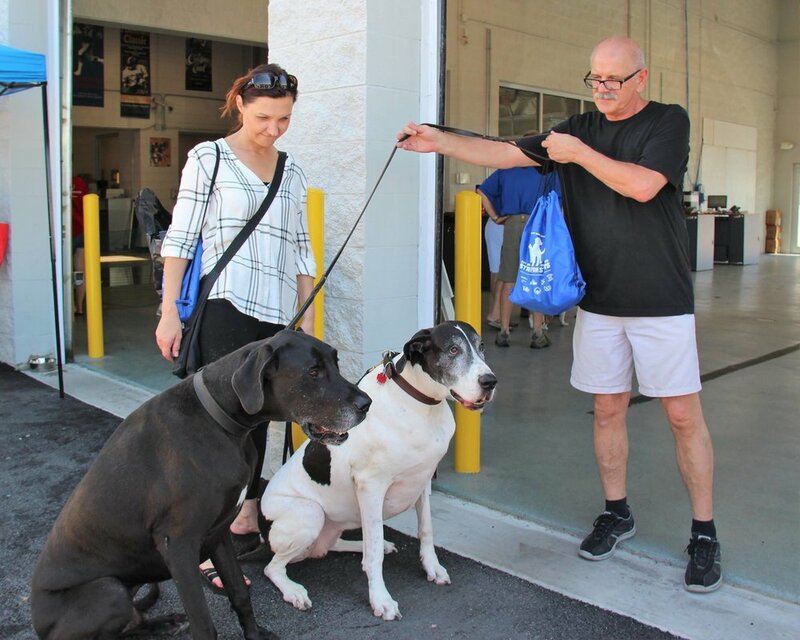 As an ALL-VOLUNTEER nonprofit, we don’t pay for staff expenses, so your donations go directly to the homeless pets we serve. 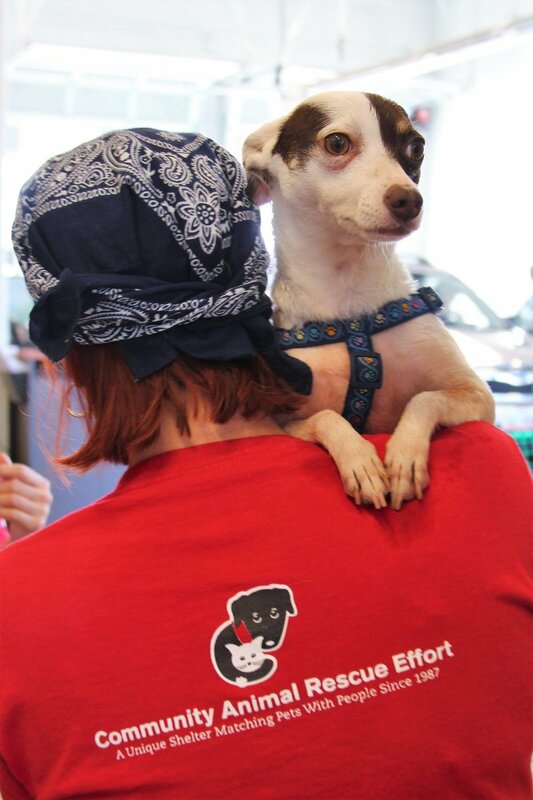 As we kick off this season of giving, we hope you keep our furry “bosses” in mind when donating on the most important fundraising day of the year. This year you can donate to C.A.R.E. through Facebook to have your donation matched (starting at 7 a.m. on 11/27). Watch for our reminders later this month! Our bosses will thank you! Happy Howlidays and a Purry New Year! Come one, come all to the Holiday C.A.R.E. Faire. Bring your pup or kit to have their picture taken with Santa. Stock up on home-baked cookies and more in our famous Cookie Walk. Buy your holiday gifts from our Silent Auction and Raffle, crafters and vendors..
C.A.R.E. 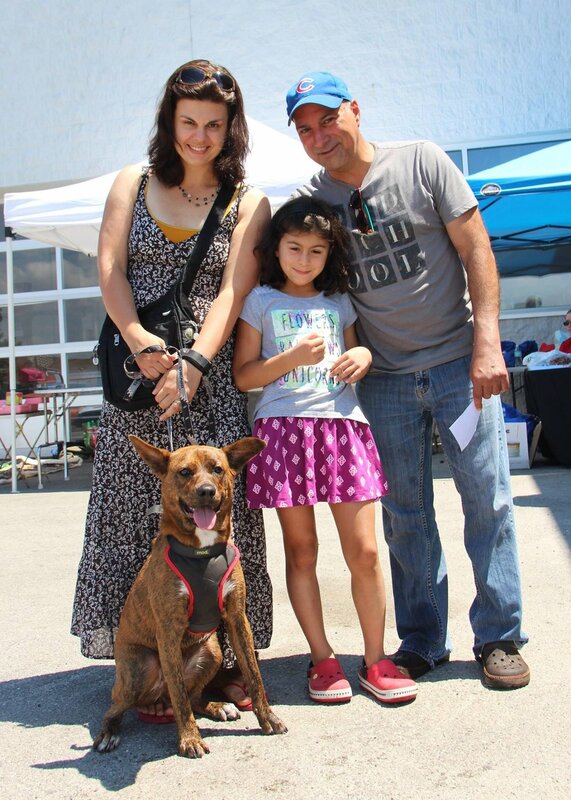 is asking Faire attendees to bring pet food donations as suggested entry to the C.A.R.E. Faire. 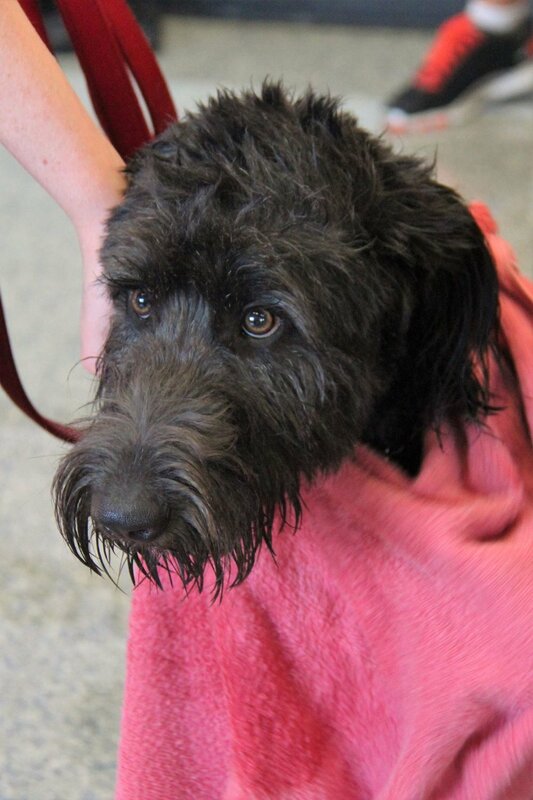 Dry dog and cat kibble (unopened bags), canned pet food and cat litter are especially needed. 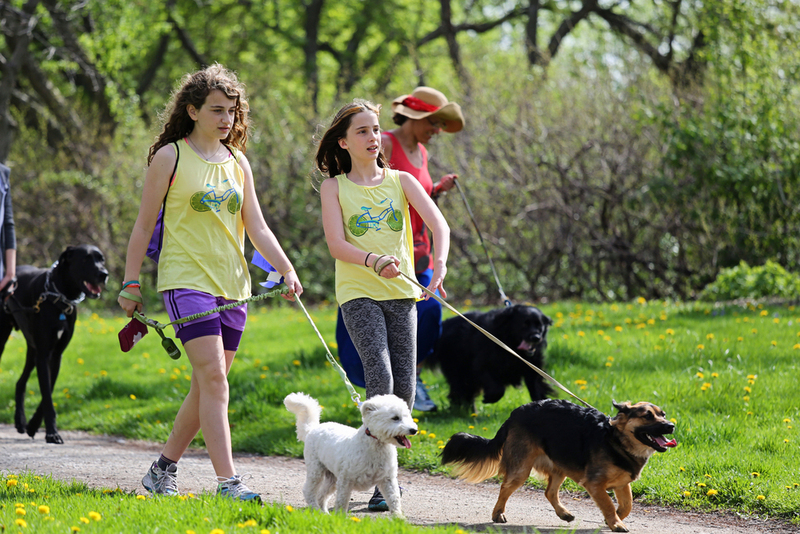 Pet food will be used for adoptable pets or to support C.A.R.E. 's Pet Food Corner at Irving Park Community Food Pantry. The C.A.R.E. Faire will be held at the Unitarian Church of Evanston, 1330 Ridge (at Greenwood). 11 a.m. to 5 p.m.
Dine for C.A.R.E. at Bakers Square! Now through October 31, spend over $20 at Sweet Ali's in Glenview and a donation will be given to C.A.R.E. Sweet Ali's, the amazing gluten-free bakery in Glenview, is celebrating 'Giving October' --- and C.A.R.E. is in the running as a beneficiary! Sweet Ali's says: "During the month of October, each time you visit the bakery and spend over $20, we will give you a token to place in your choice of 1 of 3 different charity containers. At the end of the month, we will make a donation to each charity based on the number of tokens in its container." Gluten-free C.A.R.E. Volunteers James, Janice and Megan can all attest that Sweet Ali's makes some of THE best baked goods - cookies, pies, cupcakes, cakes - in the North Shore area. That they're also GF is a bonus. Go forth and indulge your sweet tooth for C.A.R.E. at Sweet Ali's, Glenview! Our friends at Village Inn Pizzeria Sports Bar and Grill are hosting a fundraiser for C.A.R.E. 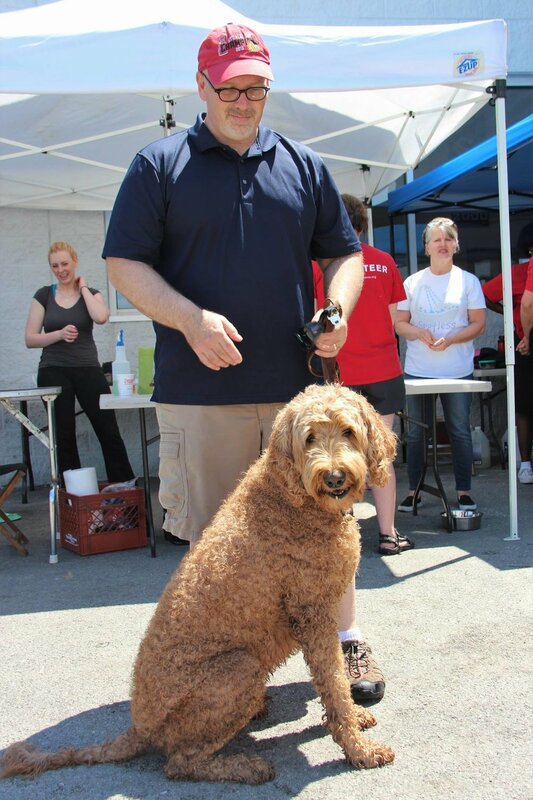 Come join us and Tito's Vodka in supporting our local animal rescue center, C.A.R.E. Every Tito's drink purchased gets $1 donated to C.A.R.E. and 20% of your pre-tax check will be donated to C.A.R.E. No flyer necessary, just mention C.A.R.E! Good stuff - no junque! Come and find that hidden treasure while benefiting C.A.R.E. ! 18-hole miniature golf tournament in teams of 4. Fun for all ages! Join us to celebrate the public grand opening of C.A.R.E. 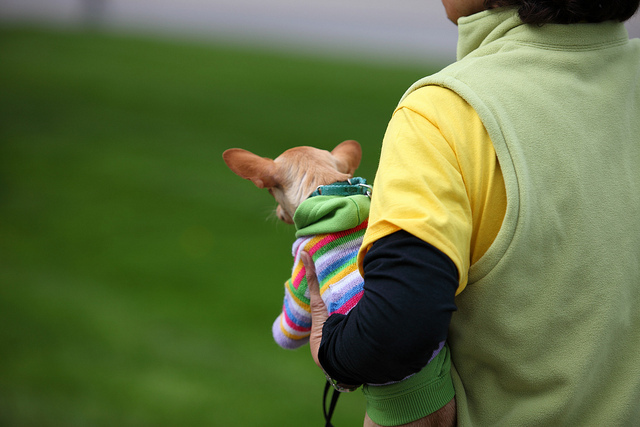 's Adoption Center, located in the heart of Skokie at 4927 Main Street. Support C.A.R.E. with a special pet tag and more!! 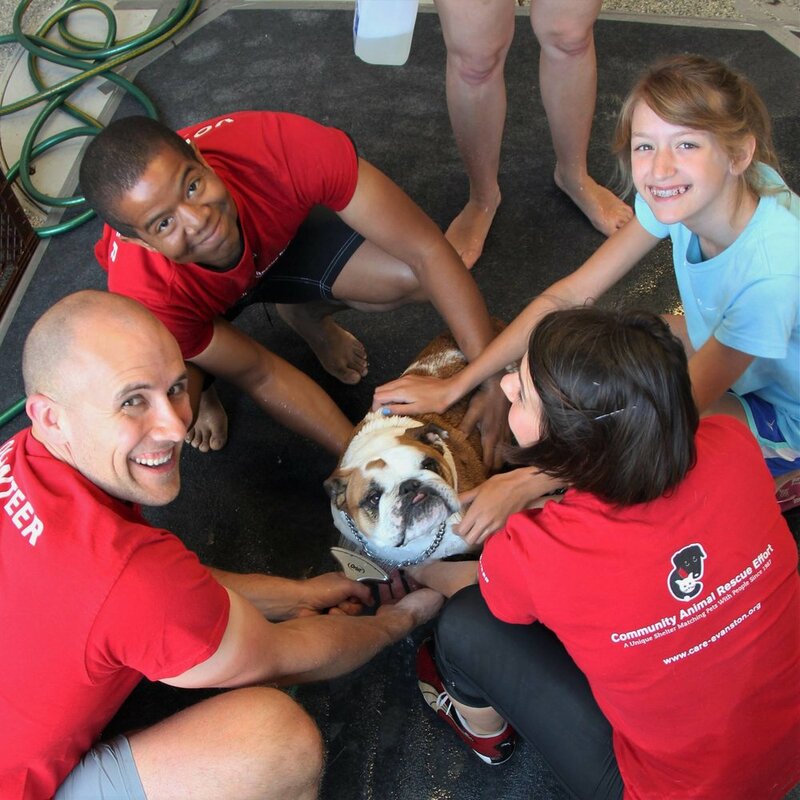 Calling all pet-loving people who want to give back! 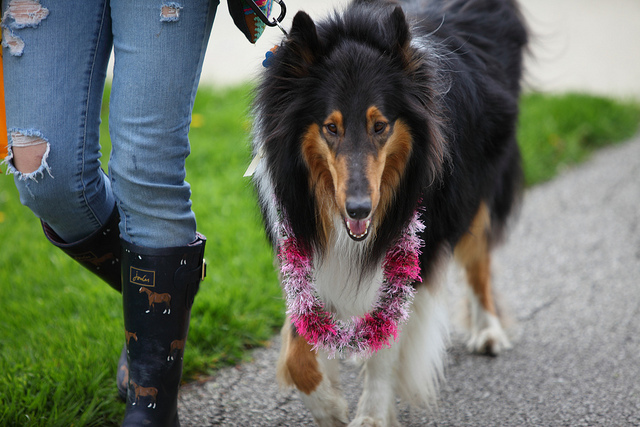 C.A.R.E.’s beautiful new Adoption Center is opening soon in Skokie. The C.A.R.E. 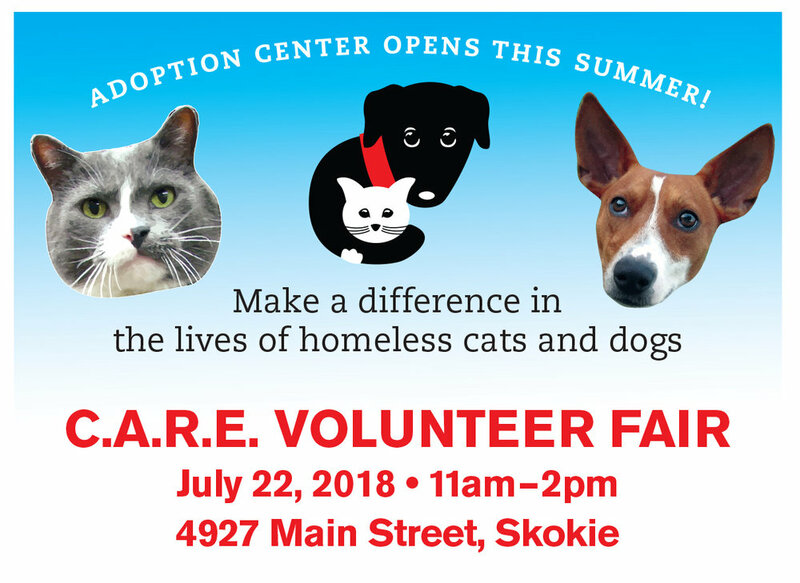 Volunteer Fair, slated for Sunday, July 22, from 11 am to 2 pm, at 4927 Main St., Skokie, will be your chance to visit the shelter and see how you can play a role. Get the details here. 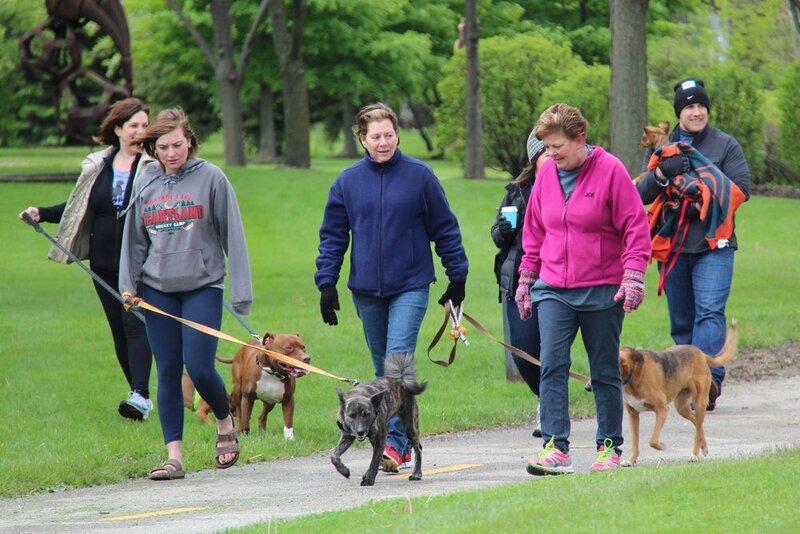 On Saturday, May 19, dogs and their guardians will make their way to Evanston Subaru in Skokie for the Community Animal Rescue Effort’s annual Strut for Strays. 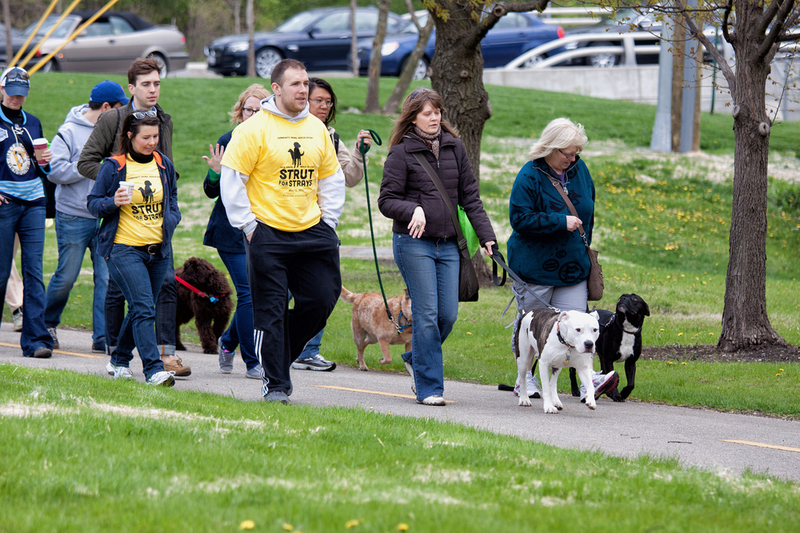 Hundreds of paws and feet will hit the ground walking (or running) for the 2.5-mile event. Benefit Square Dance for C.A.R.E. Come and watch experienced square dancers in action! Enjoy snacks, take a chance on cool raffle prizes, and take advantage of the Book Market’s one-night-only discount on purchases. All proceeds will go toward helping C.A.R.E. 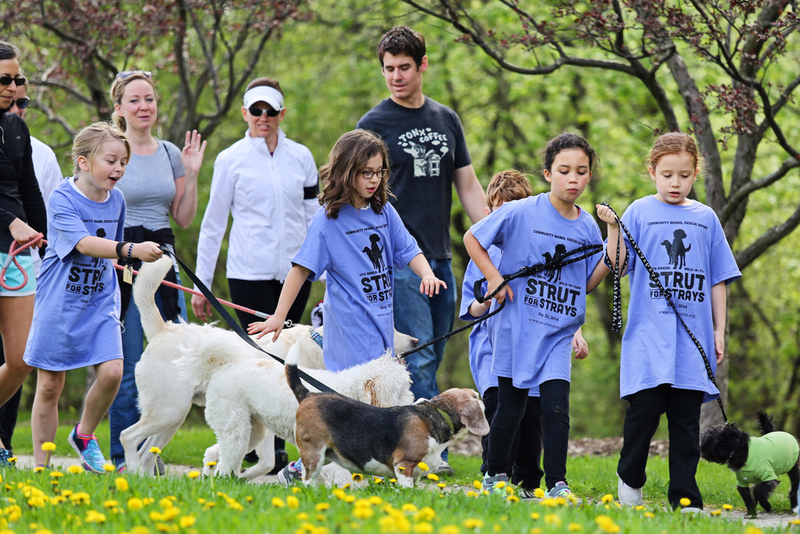 open its new Adoption & Shelter Center at 4927 Main Street in Skokie. 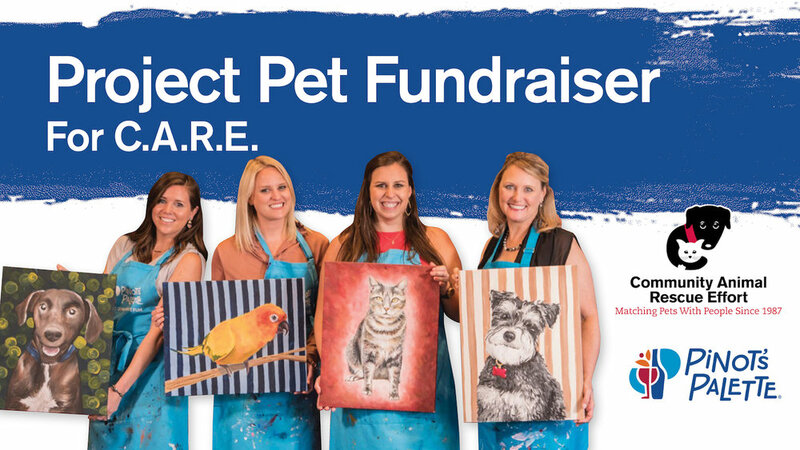 Paint a portrait of your dog, cat, gerbil, bearded dragon and support C.A.R.E.—all at the same time. At this guided painting event, Pinot’s Palette staff will be on hand to walk you through the process of creating your very own masterpiece. Wine available for purchase. Unleash your inner artiste! Elvis Presley’s LP, A BOY FROM TUPELO: THE SUN MASTERS, includes 17 songs recorded between 1953 and ‘55. The John Coltrane LP combines three of the jazz saxophonist and composer’s LPs in one limited edition package: BLUE TRAIN (‘57), GIANT STEPS (‘60) and MY FAVORITE THINGS (‘61). Cats deserved to be spoiled. 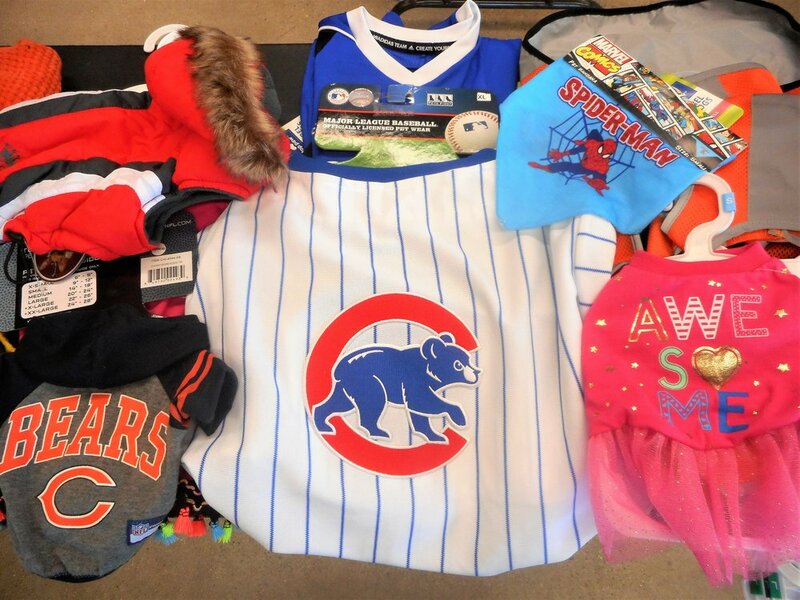 Bentley’s Pet Stuff’s basket is a good start. The basket includes Baxter Boo Tassel Ball toys, a Krazy Krinkle feather lure on a stick, a cat’s head food bowl, delectable canned turkey stew by Koha, and much more. “From The Field Pets” catnip will send your felines into a blissful frenzy—emphasis on frenzy! The gift bag also includes all-natural hemp-and-catnip chase toy, a crinkly bunny by PetLinks, hand-knit mini-toys, a catnip cigar kick toy, and bonito fish flakes by Cat-Man-Doo to sprinkle on food. Wow wow wow. Glenview-based Ten Ninety’s mission is to brew extraordinary small-batch beers. During the Beer Tasting, you and seven friends will sample four beers on tap, such as Half Wit, Sharp Wit, 90 Feet From Heaven, Angry Dragon -- or something entirely new. After the tasting, enjoy a behind-scenes brewery tour. Spoil your small pup with Bocce Bakery Biscuits, Natural Balance LIT Small Breed Treats, Merrick Back Country Treats, and an assortment of toys--4 plush, 2 squeak, ball and Chuckit Frisbee. 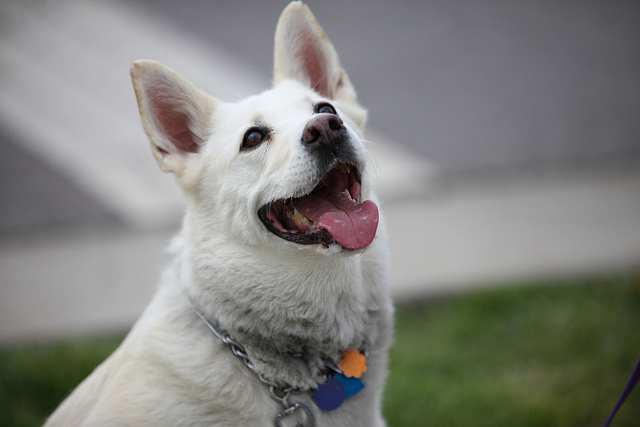 When you register, you will be asked to email a high-quality image of your pet to our contact at Pinot’s Palette. In the photo, your pet should be centered, in focus and in the foreground with no furniture or objects blocking parts of its body. If it’s a head shot, make sure there are no cropped-off ears. Look for a picture taken outside on a cloudy day or in a shaded area, or inside in natural, indirect lighting, to avoid dark shadows. 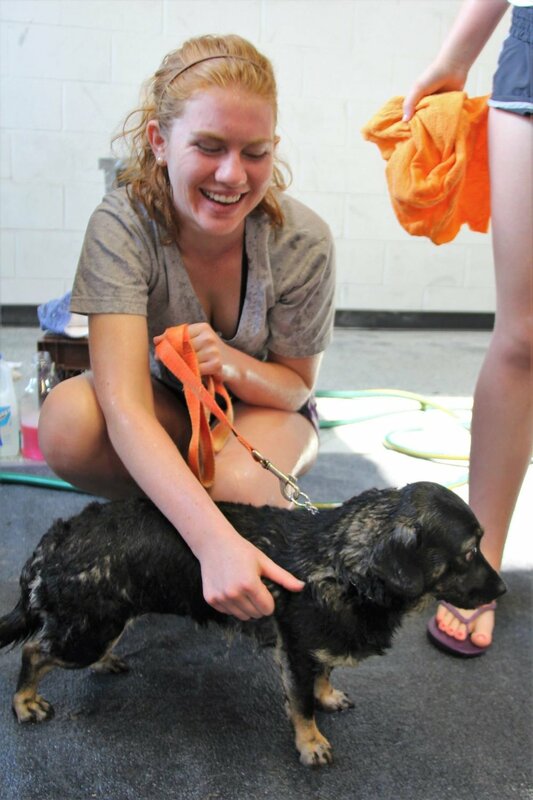 Once they receive your email, Pinot’s staff will crop out the background of the image leaving just your pet. Then the cropped image will be converted a simple line drawing and transferred onto a 16” x 20” canvas. 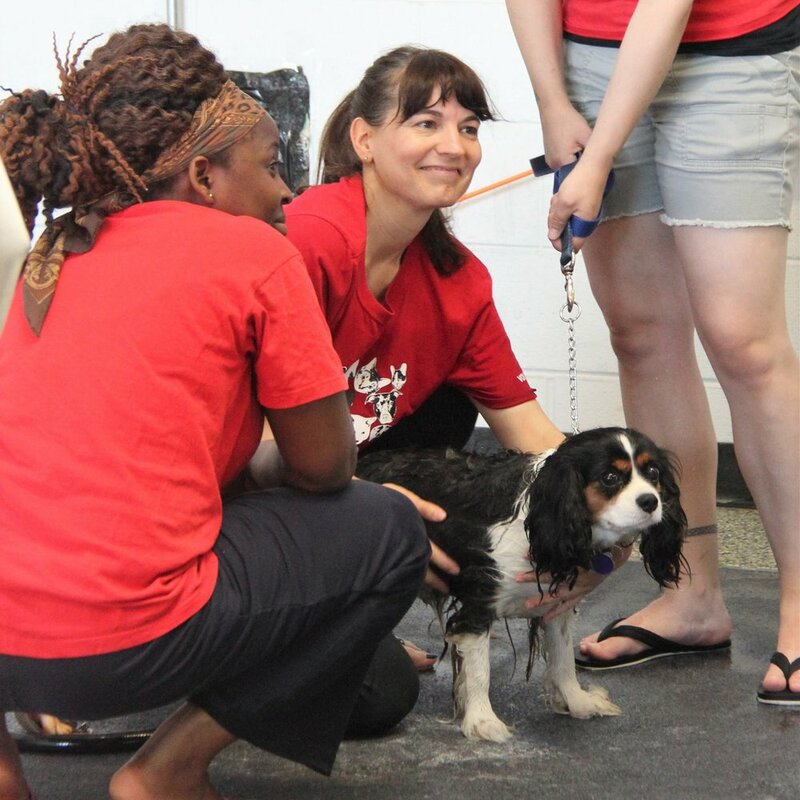 When you arrive, you will be equipped with a glass of wine, brushes, paints and expert guidance on how to paint your pet’s portrait. 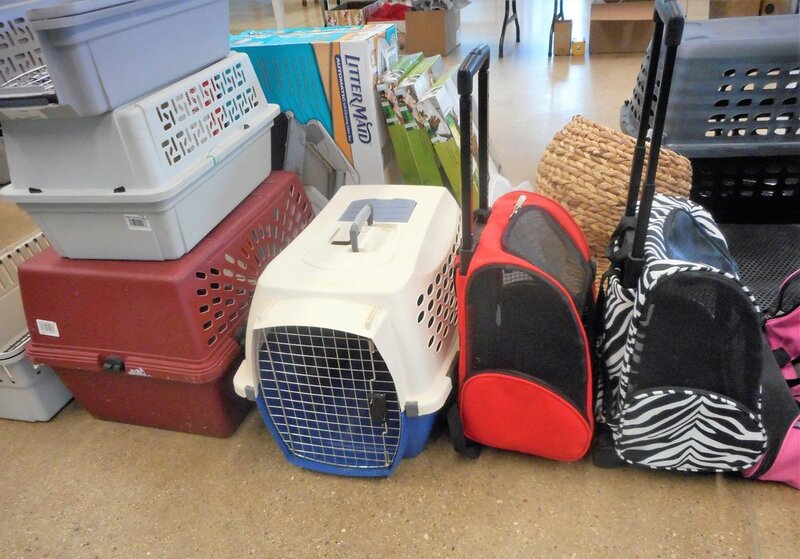 We're moving out of our temporary adoption center and getting ready to open in Skokie, and we're selling off some extra pet supplies. Tickets must be purchased prior to the event. There will be no tickets sold at the door. Trivia Teams consist of no more than 6 players. All attendees must be 21 or older on 2/25/18. Should you want to be seated with other players, please include your Team Name and/or Team Captain's name when prompted. If left blank, you may be seated with fellow animal-loving trivia players. Team Table - SOLD OUT! Join us for a very special shopping event at Ten Thousand Villages in Evanston on Friday, December 8, from 6 pm to 9 pm. Shop, enjoy free refreshments and meet C.A.R.E. 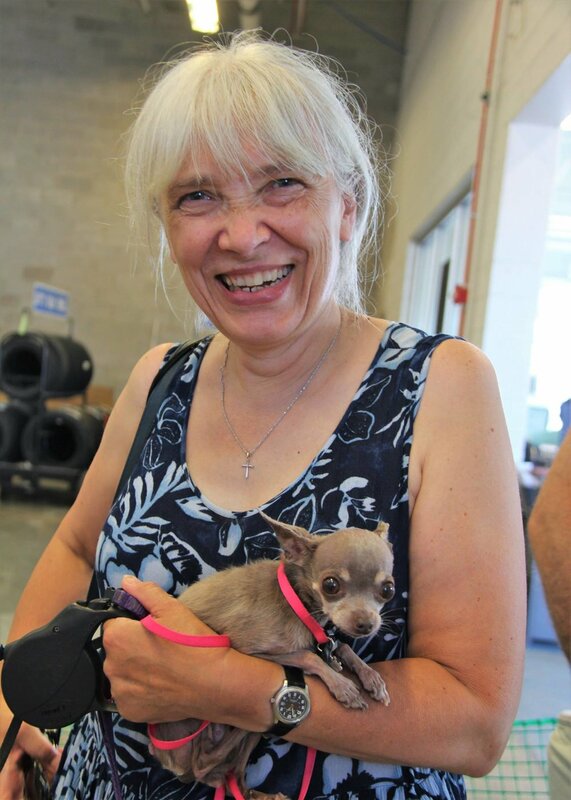 volunteers to find out about some of our pets for adoptions (our adoptables will not be present). Happy Howlidays and a Purry New Year! Come one, come all to the Holiday C.A.R.E. Faire. Bring your pup or kit to have their picture taken with Santa. Stock up on home-baked cookies and more in our famous Cookie Walk. Buy your holiday gifts from our Silent Auction, crafters and vendors..
Get all the details on our C.A.R.E. Faire Info page. Halloween Yoga with Cats for C.A.R.E. 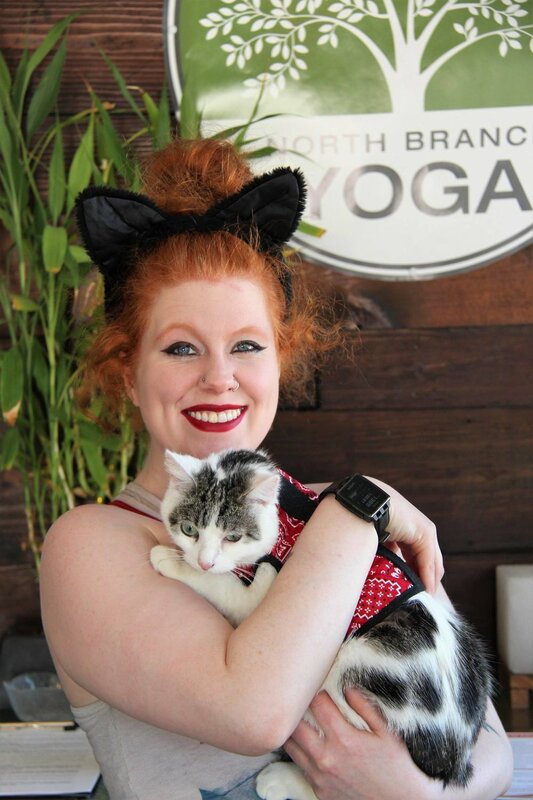 Join us (and a bunch of cats) for an all level hatha flow class at the North Branch Yoga studio that will benefit Community Animal Rescue Effort (C.A.R.E.). Meet with representatives from the organization and discover some of the cool yoga-cats looking for a home and available from C.A.R.E. SATURDAY, OCTOBER 7, 7:30 A.M. TO 1:00 P.M.
Come visit C.A.R.E. 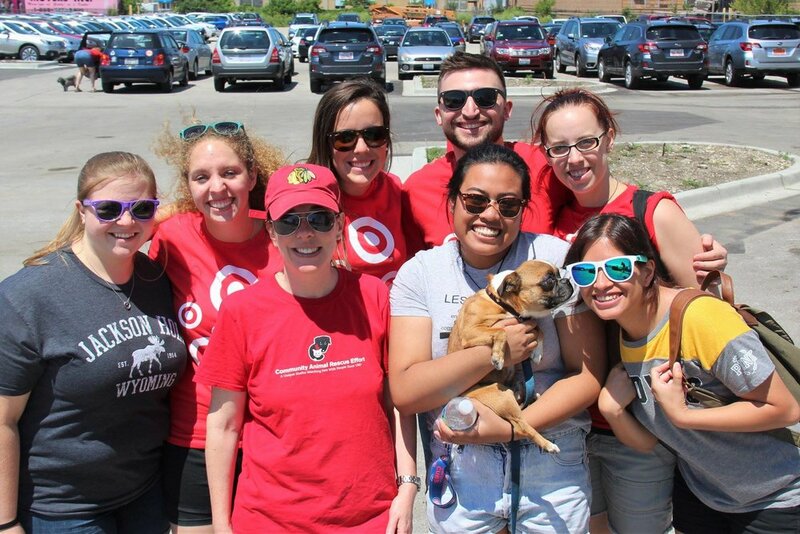 volunteers and friends at the Downtown Evanston Farmers' Market. We'll have lots and lots of delicious baked goods for sale. Shop select merchandise at See Jane Sparkle and 20% of your purchase price will be donated to C.A.R.E.